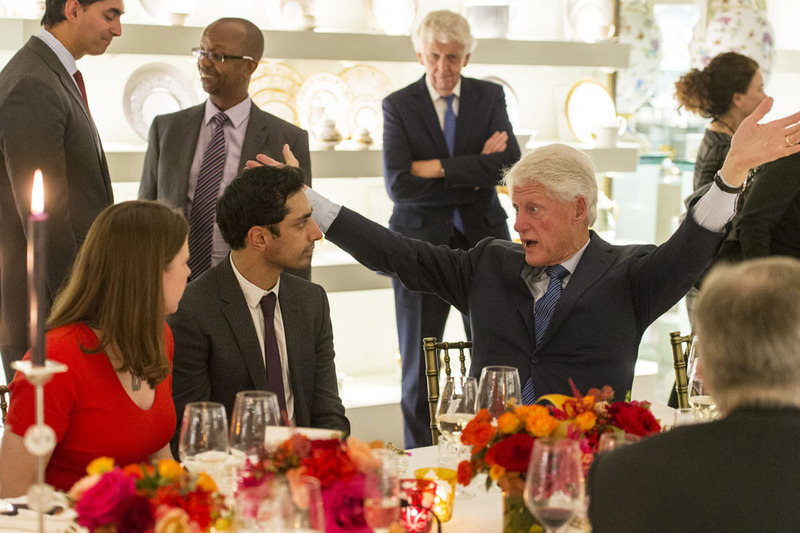 Lord Rumi Verjee hosted a fund raising dinner for the Clinton Foundation and Bill, the 42nd President of the United States (1993 – 2001) was there to talk to all the guests. The plan was to be the after dinner speaker but right at the beginning, as soon as he was introduced, he began talking about the new Trump era and the reasons it has come about, and what might be done for a better future. The starters, main course and dessert all came and went with no pause in his address to his fellow diners. Pictured here is when the coffee was on its way round while talking directly to actor Riz Ahmed (Rogue One , Star Wars / Four Lions) and Jo Swinson Lib Dem MP.